Brute force attack with cain and abel In my previous post Cain and Abel software for cracking hashes tutorial you have learnt about basic features or cain and abel. In the last of post I wrote about cracking passwords and how you dump NTLM hashes from local PC.... Go to oxidit and download Cain. Install Cain by clicking Next > Next > Next > Next > Finish > Install. With Cain open, in the toolbar click the "+" symbol to dump passwords from each category, and see which of your passwords have been saved and thus, revealed. Cain and Abel is a powerful tool that does a great job in password cracking. It can crack almost all kinds of passwords, and it’s usually just a matter of time before you get it. It can crack almost all kinds of passwords, and it’s usually just a matter of time before you get it. how to find number of moles equation Cain and Abel is a complete password recovery tool for Microsoft Operating Systems. It allows easy recovery of several kinds of passwords by sniffing the network. APR (ARP Poison Routing) is a main feature of the program. Ok, here's my understanding: you need to actually have, like previously have 'hacked'/acquired hashed passwords if cain is going to be used, it's not the type of thing you could aim at the password prompt on a website and just repeatedly hit the website- websites limit against that for obvious reasons. how to forget and forgive cheating Brute force attack with cain and abel In my previous post Cain and Abel software for cracking hashes tutorial you have learnt about basic features or cain and abel. 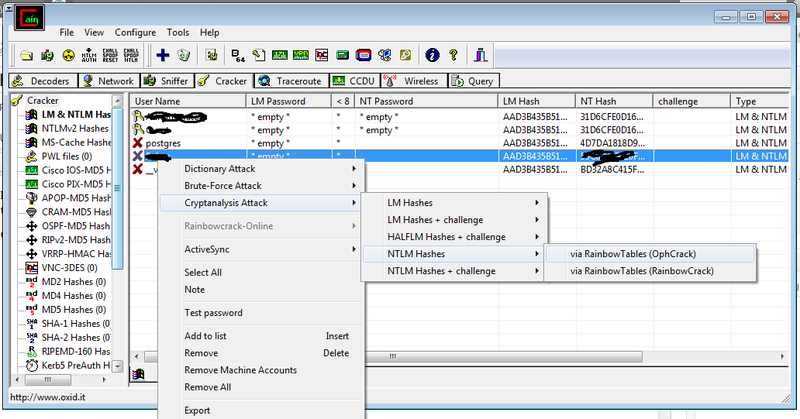 In the last of post I wrote about cracking passwords and how you dump NTLM hashes from local PC. Cain & Abel was presented since May 23, 2018 and is a great application part of Password Recovery subcategory. It gained over 17,091 installations all time and 1,350 last week. It is accessible for Windows and the interface is in English.